Kitchen Kawaii Hot pink pasta! Happy Women's Day to all the girls, young and not so young, that read our blog!!! I know, the sauce would come pink even with basic tomatoes and cream, but then.. what's the fun? 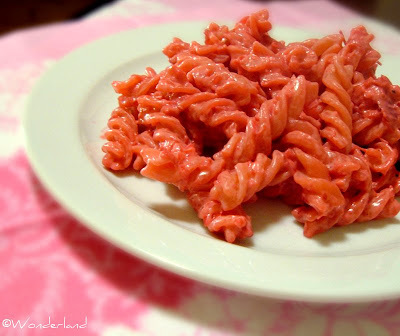 So I cooked something new, something I've never cooked before: beetroot pasta! Put a pot of salted water on to boil. Scrap the beetroots (careful they stain a lot). Finely chop garlic and onion and saute them in a saucepan with oil over medium heat. When they turn into nice golden color, add beetroot and stir for 5 minutes. Add then cheese and let it melt, always stirring. Pour the cream and add salt and a good mount of pepper. Cook at low heat until the sauce is thick enough. Hope you had a happy day, too! !